Austin Watson and Colton Sissons combined for five goals during the first three games of the first-round playoff series against the Colorado Avalanche. In their formative years, forwards Austin Watson and Colton Sissons were goal-scorers, a significant part of the reason the Predators drafted them in the first and second round, respectively. They took more than their share of bumps and bruises on lengthy roads to the NHL, eventually discovering they’d need to become checkers, penalty-killers and grinders in order to fit in on the game’s highest level. But just when we figured we knew all there was to know about Watson and Sissons, they’ve surprised us this season – and this playoffs in particular. Watson and Sissons have suddenly become point-producers once more, guiding the Predators on both ends of the ice as they tangle with a scrappy Colorado team in the opening round of the postseason. The two combined had three goals each in the first four games of the series against the Avalanche, tying them with Filip Forsberg and Ryan Johansen for the team lead. even as they were shouldered with much of the responsibility of trying to keep Colorado’s highly talented first line in check. The pair also are tied with Forsberg and Johansen in points with five. 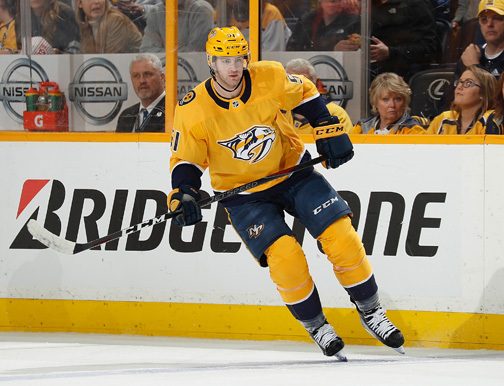 Getting a couple to go for you, as Watson put it, was what proved so challenging – on the NHL level – for both he and Sissons in earlier seasons. The 18th overall pick in the 2010 draft, Watson produced three straight years of at least 20 goals for the Predators’ American Hockey League affiliate in Milwaukee. But that scoring touch never manifested itself in Watson’s initial forays on the NHL level, which is why the Predators – faced with an overcrowded roster heading into the 2016-17 season – put him on waivers. To his credit, Watson, faced with the reality he’d gone unclaimed by the rest of the league, chose to remake his game. He became the Preds’ ultimate warrior, willing to drop the gloves, block shots and deliver the heavy hits his team needed – even if he wasn’t scoring goals at the time. Sissons’ transformation in recent years wasn’t quite as dramatic as Watson’s – he was never put on waivers – but followed a similar trajectory. A second-round pick of the Preds in 2012, Sissons notched a pair of 25-goals seasons for Milwaukee, but he couldn’t quite seem to make enough of an impact to stick on the NHL level. It was only when Sissons honed other parts of his game – his ability to serve in a third- or fourth-line defensive role, to win key face-offs and to kill penalties – that he finally found a consistent spot in Nashville’s line-up last season. It was during last season’s playoffs that the scorers-turned-foot-soldiers once again started to remind fans of the talented offensive players they’d been in earlier years. After scoring just five goals in 77 games during the 2016-17 regular season, Watson erupted for four playoff goals – all of them coming in the Preds’ upset over Anaheim in the Western Conference Final. Then there was Sissons, who, after totaling a modest 10 points in 58 games during the 2016-17 regular season, caught fire with 12 points in 22 postseason contests. Called upon to play a more significant role due to Ryan Johansen’s injury, Sissons recorded one of the franchise’s most memorable playoff moments, notching a home-ice hat trick in the decisive win over the Ducks. To their credit, both Watson and Sissons continued that offensive progress this season, despite playing in their defensive roles. The 6-4, 204-pound Watson bumped and banged his way to scoring 14 goals in 76 games, after collecting just nine goals in his first 140 contests. The cerebral Sissons piled up 27 points in 81 games, after totaling 20 in his previous 109 contests. “I think it has a lot to do with confidence,” Sissons acknowledges. “I can only speak for myself, but I was in and out of the lineup (last season), kind of struggling to find my way and my role a little bit. The evolution continues to come full circle now as the Predators hope to embark on a second straight lengthy playoff run. Heading into Game 5, Watson and Sissons have scored six of the Preds' 16 goals against the Avalanche, unexpected totals even after a season of improvement. Once coveted for their offensive abilities – and then forced to prove their other redeeming qualities – Watson and Sissons are producing points once again. “I think your role as a player is constantly changing,” Sissons says. “Obviously, when we were younger players, we both had more of an impact on the offensive side of things.